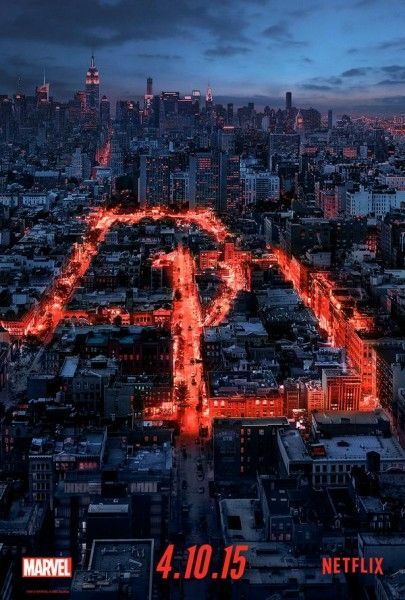 Marvel has released the full-length Daredevil TV show trailer for its first foray into the world of Netflix. The series stars Charlie Cox as Matt Murdock, a blind attorney living in modern day Hell’s Kitchen who practices law by day and fights injustice in the streets by night as the superhero “Daredevil”. Visually, there’s really nothing much to distinguish the show, although there are a few hints of how we’ll see Murdock’s sonar in action, which appears to be some pulsating effects and playing with the audio mix. And I’m okay with that, because what jumps out at me from this trailer isn’t the lack of a distinctive visual style or the lack of the signature red costume, but the emphasis on the moral question of being a superhero. I totally forgot that Murdock is Catholic, and it’s a nice addition to see a superhero in the Marvel universe wrestle with actually suiting up and going out to beat people up. Is someone good just because they knock out bad guys? After the disappointments of Agents of S.H.I.E.L.D. and Agent Carter, I’m wary of another Marvel TV series, but perhaps the third time (or being on Netflix) is the charm. Watch the new full-length Daredevil TV show trailer below. Executive produced by Steven S. DeKnight (Spartacus), the series also stars Vincent D’Onofrio, Rosario Dawson, Deborah Ann Woll, Elden Henson, Vondie Curtis Hall, Ayelet Zurer, Bob Gunton, and Scott Glenn. All 13 episodes of Marvel’s Daredevil will be released in 4K on Netflix on April 10th. Blinded as a young boy but imbued with extraordinary senses, Matt Murdock (Charlie Cox) fights against injustice by day as a lawyer, and by night as the Super Hero “Daredevil” in modern day Hell’s Kitchen, New York City. Produced by Marvel Television and ABC Studios, with executive producers Steven S. DeKnight (Spartacus), Jeph Loeb (Marvel’s Agents of S.H.I.E.L.D.) and Drew Goddard (Cabin In The Woods), the series also stars Rosario Dawson, Vincent D’Onofrio, Deborah Ann Woll and Elden Henson.